Neonates that don’t receive enough oxygen around the time of labor and delivery risk developing a dangerous brain injury called hypoxic ischemic encephalopathy (HIE). HIE is caused by decreased blood flow and oxygen in the brain. HIE can cause permanent brain damage, leaving a child with lifelong conditions, such as seizures, cerebral palsy (CP), developmental disabilities and motor disorders. A new study found that even mild hypoxic ischemic encephalopathy can cause long-term problems in a child, such as intellectual disabilities, developmental delays, learning disorders, behavioral difficulties, speech delays, autism, attention deficit disorder and dyspraxia. This research is important because there is only one treatment for HIE, and if a child is diagnosed with a mild form of HIE, she will not qualify for the critical treatment. The treatment for HIE is called hypothermia (brain cooling) treatment and it must be given within 6 hours of the time the baby was deprived of oxygen. This usually means the treatment must be given within 6 hours of delivery. Hypothermia treatment for HIE has been shown to halt almost every injurious process that starts to occur when the brain experiences an oxygen-depriving insult. The treatment can significantly decrease the likelihood that HIE will cause permanent brain damage; research shows that this can prevent a child from developing cerebral palsy or it may reduce the severity of the CP. Hypoxic ischemic encephalopathy (HIE) is the most common type of birth injury. It is often caused by oxygen deprivation (birth asphyxia) that occurs during or near the time of birth. During labor and delivery, problems with the umbilical cord, placenta or uterus can cause birth asphyxia. Listed below are conditions that can occur during or near the time of birth that can cause birth asphyxia and hypoxic ischemic encephalopathy (HIE). Anesthesia mistakes, which can cause blood pressure problems in the mother, including a hypotensive crisis. This can greatly decreases the supply of oxygen-rich blood going to the baby, causing birth asphyxia. Intracranial hemorrhages (brain bleeds), which can be caused by a traumatic delivery. Forceps and vacuum extractors can cause brain bleeds. Sometimes intense contractions (hyperstimulation) caused by labor induction drugs (Pitocin and Cytotec) can cause head trauma. Mismanagement of cephalopelvic disproportion (CPD), abnormal presentations (face or breech presentation), and shoulder dystocia also put the baby at risk of experiencing birth trauma and birth asphyxia. Mismanaged breathing problems after birth, such as failing to properly intubate and place baby on a breathing machine (ventilator); untreated apnea or respiratory distress; improper settings on the ventilator, which can cause overventilation injuries such as prolonged hypocarbia. These conditions can cause hypoxic ischemic encephalopathy (HIE), permanent brain damage and lifelong problems such as cerebral palsy if they are not properly managed. Proper management almost always entails quickly delivering the baby before the oxygen deprivation starts to cause brain injury. The baby is supposed to be continuously monitored with a fetal heart monitor during labor and delivery. If the baby starts to become deprived of oxygen, the heart monitor will show nonreassuring heart tracings. Once these occur, it is the job of the medical team to try and alleviate the fetal distress. The team must also make preparations for a quick emergency C-section, in most cases. Babies experiencing oxygen deprivation must be delivered within 18 minutes, in most cases. In severe cases of birth asphyxia, such as a complete placental abruption or umbilical cord compression, the baby must be delivered a lot sooner, usually within a matter of minutes. A delayed delivery can cause hypoxic ischemic encephalopathy in the baby. HIE typically occurs in term babies, although premature infants can also develop HIE. When premature babies experience birth asphyxia, however, they often develop periventricular leukomalacia (PVL). HIE usually involves damage to the basal ganglia, cerebral cortex or watershed regions of the brain, but it sometimes does include periventricular leukomalacia (PVL). If there is any possibility that a baby suffered a lack of oxygen in the brain, it is crucial for the medical team to closely monitor the baby for signs of hypoxic ischemic encephalopathy (HIE). The reason this is crucial is because hypothermia treatment is not given unless a diagnosis of HIE has been made. If a diagnosis is not promptly made, a baby may not receive the treatment, which means her brain injury may be much more severe than it would have been. The more severe the HIE, the sooner the hypothermia treatment must be started. Indeed, failure to promptly diagnose HIE is negligence. Low APGAR scores for longer than 5 minutes. An APGAR score assesses the overall health of a newborn over the first few minutes of life. It assigns scores to factors such as the baby’s skin color / complexion, pulse rate, reflexes, muscle tone, and breathing. Physicians at different hospitals may use varying methods for diagnosis of HIE. The key is for them to recognize signs of HIE, quickly diagnose the condition, and then begin hypothermia treatment. If the baby meets the criteria for hypothermia treatment listed above, the therapy should be started right away. Of course, if a diagnosis is made without all the criteria being met, hypothermia treatment should still be given, as long as the baby was born at or later than 36 weeks (greater than 35 weeks at some hospitals), the oxygen-depriving insult occurred within the 6 hour time frame, and there are no contraindications to the treatment. Hypothermia treatment is very easy to give and as of yet, researchers have not seen harmful effects of the therapy when it is properly implemented. If you are seeking the help of a Michigan HIE attorney, it is very important to choose a lawyer and firm that focus solely on birth injury cases. Reiter & Walsh ABC Law Centers is a national birth injury law firm that has been helping children with birth injuries for almost 3 decades. 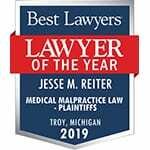 Michigan HIE attorney Jesse Reiter, president of ABC Law Centers, has been focusing solely on birth injury cases for over 28 years, and most of his cases involve hypoxic ischemic encephalopathy (HIE) and cerebral palsy. Partners Jesse Reiter and Rebecca Walsh are currently recognized as being two of the best medical malpractice lawyers in America by U.S. News and World Report 2015, which also recognized ABC Law Centers as one of the best medical malpractice law firms in the nation. If your child was diagnosed with a birth injury, such as cerebral palsy, a seizure disorder or hypoxic ischemic encephalopathy (HIE), the award-winning Michigan HIE attorneys ABC Law Centers can help. We have helped children throughout the country obtain compensation for lifelong treatment, therapy and a secure future, and we give personal attention to each child and family we represent. 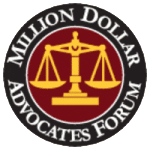 Our nationally recognized birth injury firm has numerous multi-million dollar verdicts and settlements that attest to our success and no fees are ever paid to our firm ­until we win your case. Email or call Reiter & Walsh ABC Law Centers at 888-419-2229 for a free case evaluation. Our Michigan HIE attorneys are available 24 / 7 to speak with you. Watch a video of Michigan HIE attorney Jesse Reiter discussing how birth asphyxia can cause HIE, which often results in seizures. Most neonatal seizures are caused by hypoxic ischemic encephalopathy. Michigan HIE attorney Jesse Reiter obtained $6.9 million for a child who has cerebral palsy from HIE caused by a delayed C-section. Cerebral palsy lawyer Rebecca Walsh and Michigan HIE attorney Jesse Reiter discuss twin pregnancies and HIE. Michigan HIE attorney Jesse Reiter discusses how HIE can cause cerebral palsy.